The Goodman Report announced that 6675 Dow Avenue and 6691 Dow Avenue were bought for $43.2 million. “The two lots are currently improved with two rental apartment buildings providing good holding income during the rezoning process: 6675 Dow (23 units) and 6691 Dow (15 units),” according to the well-known real-estate market resource. The Goodman Report noted that the 35,580-square-foot property is designated as a high-density, mixed-use development in the city’s Metrotown Downtown Plan. According to the plan, high-density, mixed-use areas are “characterized by commercial podiums with high-rise office and residential building forms”. “The intent is to establish a walkable downtown with character streets activated by retail, restaurants, cafes, and other commercial uses that meet the day-to-day needs of citizens,” the plan states. The Metrotown area is bordered by Boundary Road to the west, Royal Oak Avenue to the east, Imperial Street to the south, and various northern boundaries, including Bond and Dover streets. The neighbourhood has seen many apartment buildings sold and demolished for new condo developments. 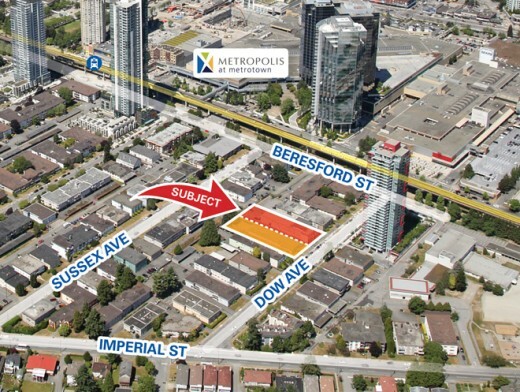 In the same announcement, the Goodman Report stated that two more Metrotown-area apartment properties at 6470 and 6508 Silver Avenue are for sale. The two properties, which were listed last month, are being offered for $52 million.